Yet I had never caught a musky there. Musky Hunter’sEditor, Jim Saric , laughed at me once when I told him about my lack of success there, and proceeded to tell me about all the big muskies that he had caught from the rock bar. Of course, that only increased my frustration. These thoughts were going through my mind late last October as my buddy Kevin Schmidt and I eased up to the rock bar. A strong east wind was keeping the boulders awash in current, and we noted pods of baitfish on the electronics suspended upwind of the rock bar. We had yet to boat a fish that day, though we’d raised several off similar spots where the baitfish ‘ which we later found out were whitefish ‘ were staging prior to their after-dark spawning forays. I stood and fired a bright chartreuse Reef Hawg over the rock bar and started the jerkbait on its erratic dance back to the boat. A subtle strike registered through my cold-numbed hands and I swung through the hookset, finally catching up to the fish near the end of the swing. As I reeled down to hit it again, the fish rose like a submarine with the Reef Hawg straddling its snout, and I dared not set again for fear of ripping the heavy lure free. After a brief, but powerful struggle, I eased the 47-incher into the net. Its distended belly indicated that several whitefish had already met their fate, and we estimated the musky’s weight at about 30 pounds. 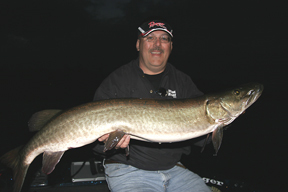 You already saw this fish with my article, ‘Sorting Out Superlines’ in the February/March 2001 issue of Musky Hunter. After a few photos it was released, and I couldn’t wait to call Saric and tell him I’d finally cracked the rock bar’s code. But six hours later we hadn’t caught any more fish. We’d raised some while casting, but hadn’t had any action while trolling around the whitefish schools. Darkness was approaching, and we knew the rock bar would be our last spot for the day. We noticed on the electronics that the baitfish schools had moved closer to the shallows in anticipation of an after-dark spawning movement. My first cast with the same Reef Hawg was met with a hard strike. I set the hook and locked up with a tanker of a musky, not very long but very, very deep. Upon netting the fish, Kevin and I were amazed at its bulk ‘ now, 45-inch muskies don’t weigh 30 pounds, but this one was trying. We estimated it at somewhere in the high 20-pound range (I wasn’t going to call it a 30-pounder without putting it on a scale) and I let the fish go. While we’d been fighting, unhooking and photographing my musky, the wind blew the boat off the rock bar so Kevin and I repositioned it upwind of the structure. Two casts later, Kevin rocked the boat with a hard hookset as his white Bull Dawg was ambushed among the shallow boulders. A broad tail slapped the surface, and I rea liz ed this was a special fish and easily scooped it with my Frabill Big Kahuna net at the first opportunity. The giant stretched the tape to 51 inches, and we estimated its weight at about 35 pounds. After photos, it too went back in the water to haunt whitefish. The day’s results were amazing ‘ three 30-pound class fish in one day off a structure I’d never caught a musky from before. Sure, it was buffeted heavily by the wind, but so were lots of other places where we didn’t raise a single musky. The key was the schools of whitefish staging just off the rock bar ‘ the muskies were moving up in packs to feed, and thanks to this we enjoyed a terrific day. Musky fishing can be as complicated as you want to make it, but it can also be remarkably easy. Being predators, muskies are going to be found near their food source ‘ find baitfish and you’ll find muskies. That may seem overly simple, and it is. But it’s also the truth. The first key to finding baitfish is understanding what makes up the forage base of your favorite lake. Perch, suckers and bullheads are very important to muskies in every lake where they’re found. In lakes with gizzard shad, ciscoes or tullibees, muskies will often be located nearby. At times, you’ll find muskies near walleyes, crappies, bluegills, shiners, whitefish and lake trout, and in some lakes they won’t be far from smallmouth bass. Perch, suckers, bullheads, walleyes, bluegills and smallies will usually be near structure. Crappies and gizzard shad will be near cover early in the season and suspend over open water later, a trait that walleyes often follow, too. The rest will usually suspend over open water. Therefore, where you start looking for baitfish depends on what’s in the lake and/or the time of year. If the main forage consists of perch or suckers, for example, fish near structure. If the primary forage is crappies, look for muskies near structure early, then suspended off weed edges later. If the main forage is ciscoes, you will find some muskies suspending all season long. The easiest way to find concentrations of baitfish is with a good depthfinder. Schools of baitfish will often look like clouds on the depthfinder’s screen, suspended over open water or just off structure. But if there are no suspended baitfish available or they’re scattered, look to the structure, be it weeds, boulders, fish cribs or shoreline wood, and points or breaklines. While you can find baitfish by driving your boat haphazardly about the lake and watching your electronics, it’s best to look in wind-blown areas first. Big or small, baitfish or predator, all fish use the wind to some extent. Typically, baitfish will position on upwind sides of structures. In turn, muskies use the current and turmoil created by the wind to feed. A combination of electronics, structure and wind helped my partner, Tom Dietz, and I finish third in the Professional Musky Tournament Trail’s Invitational Championship in 2000. The Minocqua Chain of Lakes, where the event was held, had just experienced fall turnover the week before and despite pre-fishing we didn’t have a pattern established. We blanked the first day, but near the end of it noticed that schools of baitfish were starting to hold in deep water on the upwind side of basin-related points in Kawaguesaga Lake, one of the three major waters of the chain. The next day, I caught a 40 1/4-inch musky right away in the morning off the wind-blown side of one of these basin-related points. This fish got us in the hunt, and we spent the remaining tournament time bouncing back and forth between three wind-blown points, moving another seven or eight muskies before tournament hours ended. I caught a slightly-undersized fish with a half hour to go that would have lifted us into second place had it been just a little longer, and Tom and I ended the tournament with the feeling that we just ran out of time. While most of the tournament boats continued to pound the shallows, where the majority of the muskies had been caught the week before in Rollie & Helen’s Fall Meltdown tournament, Tom and I kept the boat positioned over 20 feet and cast to water no shallower than 12 feet. The baitfish were ‘balled up’ and positioned on each of the three points along the breakline at around 16 feet. Besides watching your electronics, it pays to be observant of the wildlife around you as well as other fishermen. If gulls are feeding in an open water area, you can be reasonably certain they’ve found a school of baitfish near the surface. 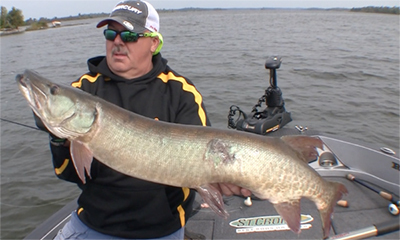 If anglers seeking walleyes or panfish are concentrated in one area, wait until they leave and then fish the area and you’re sure to find muskies. A few years ago while I was still guiding, an inside turn in a weed edge produced three 40-inch-plus muskies in three days after I’d noticed perch fishermen doing well there in the evening. We just fished it after dark and enjoyed great action. Another time I observed bluegill anglers boating fish after fish before dark, and I then fished that area after they’d left. Even though the spot was not part of my usual ‘milk run’ on that lake, the result was a 41-inch musky that salvaged an otherwise fishless evening. And if you’re striking out everywhere, work shallow. Regardless of the fish species, shallow fish are often very active. Very shallow water is often loaded with small panfish and shiners, and muskies know this. I key on either the inside weed edge or around shallow reeds or rocks. You may not find many muskies doing this, but those you’ll find will be very catchable. 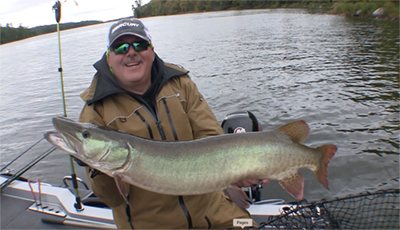 During warm days in fall, musky anglers fishing typical late season patterns often struggle. However, solar heat in shallow water will draw muskies not only for the warmer water, but for the baitfish also attracted by the warmth. You’ll often find the muskies among the brown, dead weeds, feeding actively ‘ I know this goes against the ‘book,’ but muskies can’t read. I’ve seen this pattern work enough on warm fall days to know that if you ignore the shallows, you’re also ignoring muskies. There are a handful of situations in which concentrations of baitfish are the entire key to musky location ‘ open water, and spring and fall baitfish spawning movements. 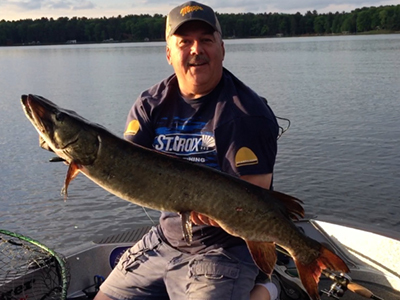 Open water musky fishing can be confusing to the beginner … as in where to begin. I won’t even consider trying open water unless I see baitfish on my electronics, and the higher in the water column the better. Open water fishing can be needle-in-a-haystack stuff, but if I spot baitfish on my electronics in the upper 15 feet of the water column while motoring over deep water, I’ll stop and fish. 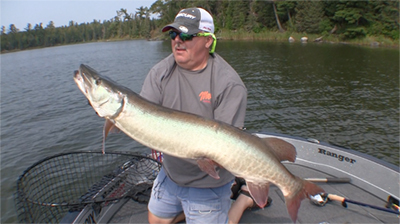 When fishing open water, it’s important not to place your lures below the muskies. It’s tempting to run lures at the same depth at which you see big ‘hooks’ positioned below the bait on your screen, but you’ll catch more if you keep your lures in the top couple of feet of the water column. Remember, it takes only a kick or two of the tail for a musky to come up 15 feet to eat a lure. Some guys I know even fish for suspended muskies with topwaters ‘ they’ll drive the boat until they find baitfish on their electronics, then shut down and treat the baitfish school as if it was a giant weedbed. They fancast with side-to-side topwaters like Dancin’Raiders and Jackpots, and have the photos to prove the technique works. Most baitfish species also become concentrated while they spawn. In regions where the musky season is open early or doesn’t close, it pays to follow schools of spawning suckers because the muskies will be with them. Pelagic species such as ciscoes, tullibees, whitefish and lake trout spawn in the fall, and large schools of them can often be spotted on your graph, suspended just outside the spawning areas. Whitefish and lake trout are the first to spawn, typically staging when the water temperature drops to the low 50s and finishing their spawn when the temperature is in the high 40s. Ciscoes and tullibees begin staging when the water temperature is about 45 degrees and spawn when it is 39 to 42 degrees. Casting or trolling (where legal) through the baitfish schools, or in the areas where they spawn, can yield giant. In musky fishing, there are lots of things to worry about if you wish ‘ some concern themselves with pH, water temperature, dissolved oxygen, wind, barometric readings, moon phases, etc. I worry about these things too, sometimes probably more than I should. But if you really want to simplify your musky fishing, look for baitfish. Like lions that never stray far from a herd of gazelle on some Discovery Channel special, muskies won’t be far from their food. Find baitfish and all you have to do is worry about is getting the muskies to bite. And that is another story.